I’m happy leaving crazy, busy Žabljak, there’s too much going on here and too many people to make it a relaxed trail town. 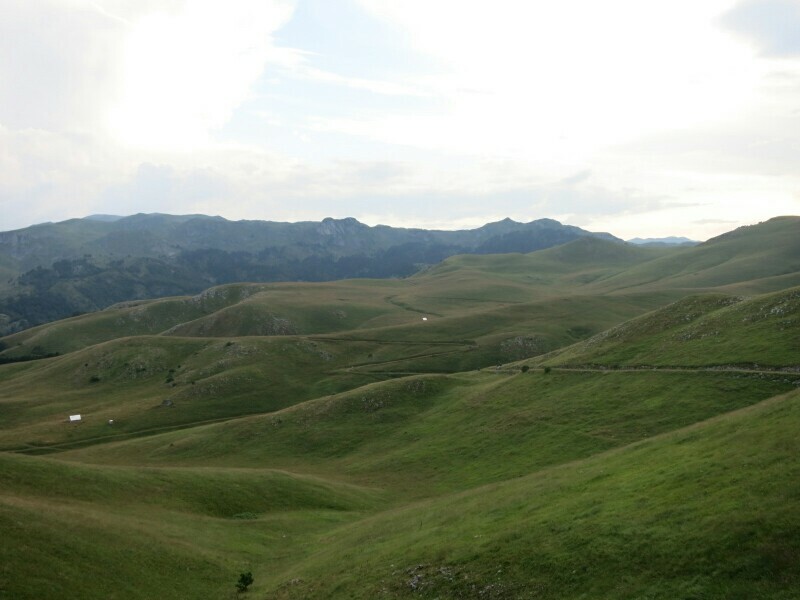 The hike to Njegovuđa is about 9 kilometers and it follows partly a paved and partly an unpaved road which leads along small houses and farmland. 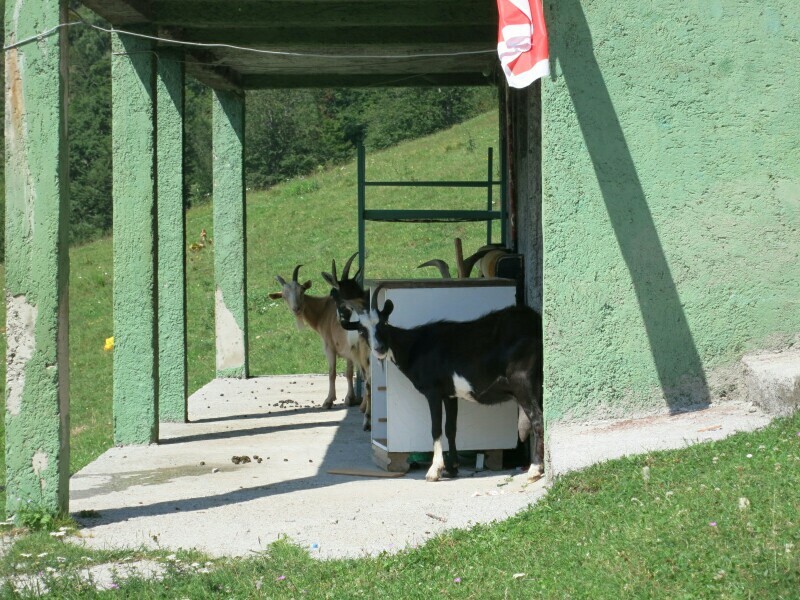 In Njegovuđa (just a bit offtrail), a surprise waits; here there are a café (also serving food) and a small convenient store! After a fast pits stop, I had a late start and there’s a storm building, I hit the trail again. While hiking in the woods, just after passing the lake, it starts raining. Since the rains are fierce here I set up my tarp and seek shelter for the next 1.5 hour. After the forest the trail really gets nice and it stays so all the way to Mojkovac. It actually surprises me. I didn’t prepare this stage and thought it would be way less interesting and wild. 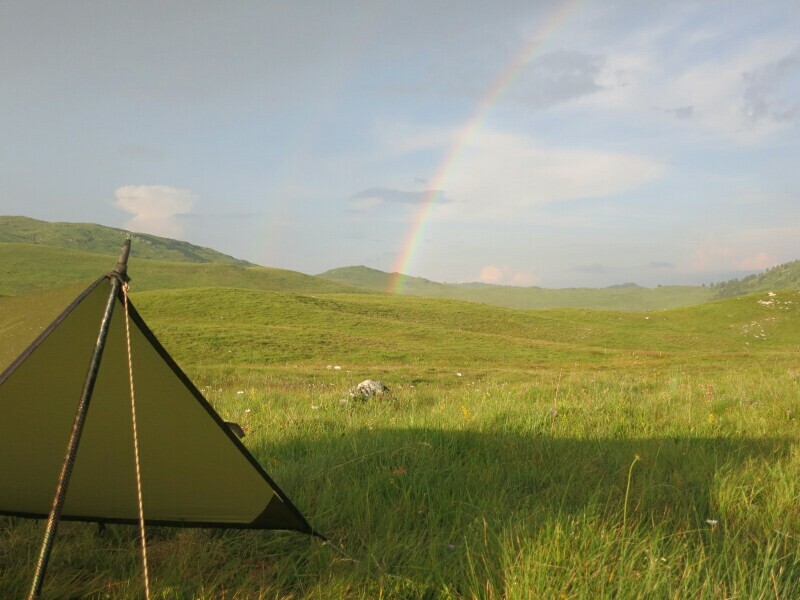 After a few more hours of hiking it starts raining again and I pitch my tarp somewhere in a field. The next day the trail sometimes is a proper trail, it sometimes follows an unpaved road and sometimes there’s just a few sings hiding in the grass. A bear on the Via Dinarica! After Zabjsko jezero the trail leads through a forest. Because of the lots-of-mud+uphill+trail runner-combination I struggle a bit to get uphill. Than, suddenly I see a bear walking towards me! He doesn’t notice me until we are very, very close to each other. It turns around and speeds off. 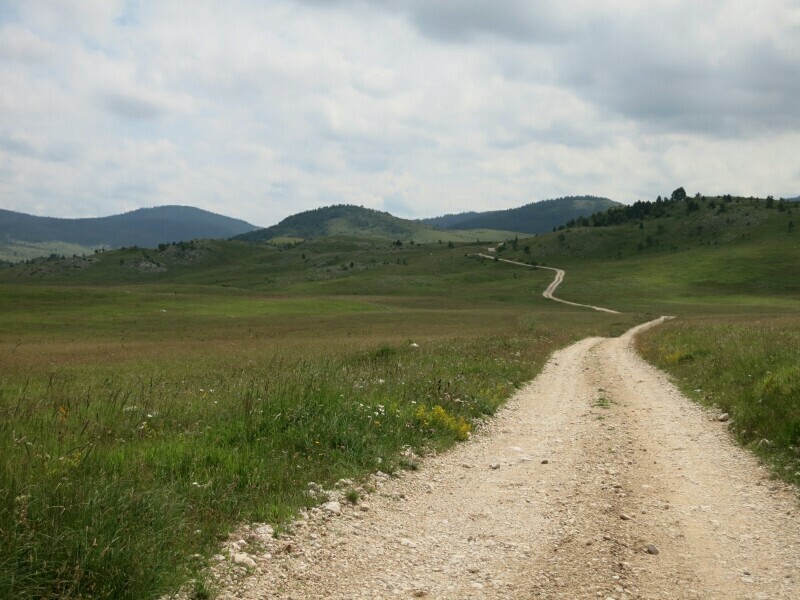 A dirt road leads into Ružica where I am welcomed by barking dogs and a herder. He offers me coffee just at the right time; the air is rumbling and it starts raining. The herder and his wife take really good care of me, offering me fresh bread, a baked egg and cheese and off course, homemade raki. When the rain stops it’s time to leave, and after showing me the spring at the other side of the village, I say goodbye (and a big thank you). From here the trail follows an unpaved road for a lot of kilometers, but this road doesn’t hurt to hike. It leads along old (and new) wooden houses, it’s got great views and there are a few springs along the trail. 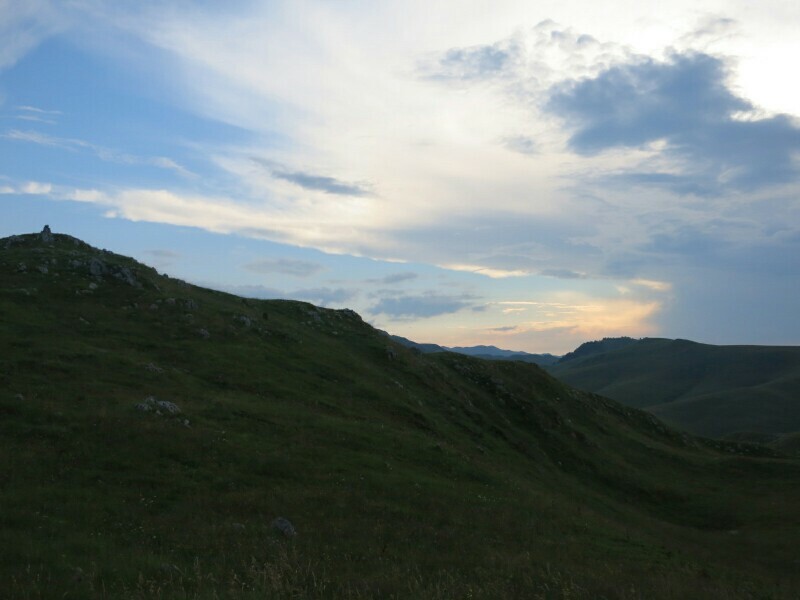 A few hours hiking from the town of Mojkovaj I set up my tarp; I’m done for today. Along the unpaved road/trail local people are collecting berries, a little ways down I find myself some decent sized raspberries. It’s snack time! Because of rains there’s clouds hanging over the valley, my head’s propably in the clouds too; I miss the trail into town and hike a small detour. I like Mojkovac as a trail town; it’s small and there isn’t a lot going on here. It’s got a few hotels, grocery stores and restaurants. It’s right on the trail and everything is within walking distance. I’m a bit late arranging the permit for crossing the Montenegro/Albanian borders by foot. So, I need to slow down my hike, while the permit is getting arranged. From Mojkovaj I hike up to Dom Džambas, which is about 10 kilometers. The hike out of town is interesting; the GPS track is a little bit off, there are markings (sometimes) and the trail sometimes disappears in thick bushes. Oh and watch out not to walk into someone’s garden; the dog probably doesn’t like that (and you neither). There’s also a slightly eroded road (wouldn’t want to hike that when it’s raining). After this (just a few km’s) the trail hits an unpaved road. 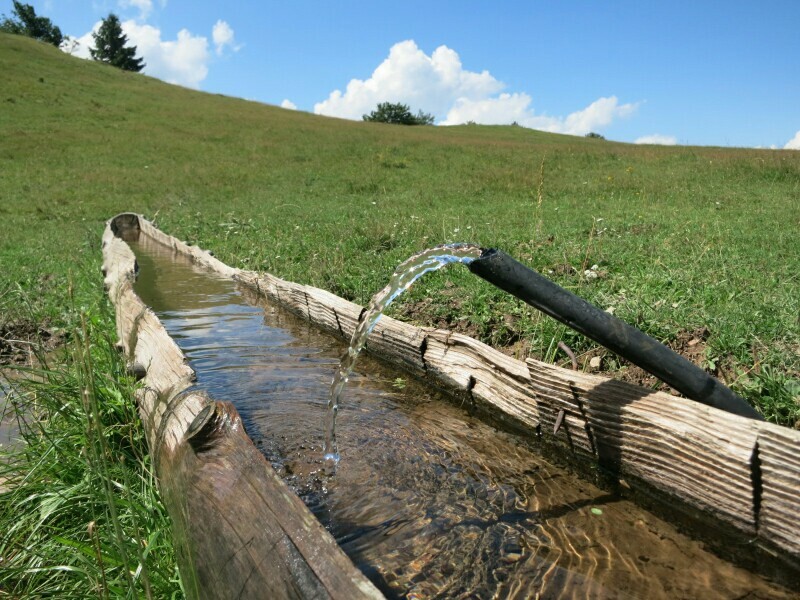 At about two kilometers before the Dom there are two springs, close by a katun, just after the crossing by the cemetery. I did not meet anyone at the hut, but it’s a good place to hang out. There are benches under a veranda and there’s a fire pit and views on Mojkovac and the valley. There’s not outside water access at the hut, but there are houses nearby and a spring a few hundred meters down the trail.